In this section I will be taking you through the steps of placing orders both on Ideal Envelopes and our PaperCard sister web site. Please note this is only an option for mainland UK, Ireland and Scottish Highlands & Islands. Our Web Development Team have made both websites talk to each other. 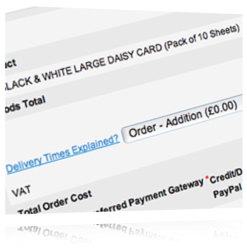 If you were to place an order on the Ideal Envelopes web site and then go onto PaperCard, The PaperCard website will know you have a current live order and to combine these orders together within our warehouse for dispatch. Please see below a few simple steps aid you to get both your orders placed. 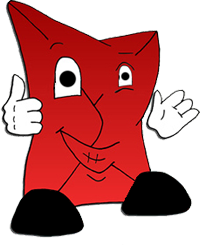 I've been asked to tell you, if you require any further information regarding placing orders on both sites, then do not hesitate to contact the Sales Team on 0845 4636249 between 9.00 am and 5.00 pm calls are charged at your normal national rate, they will be only to willing to help you. Firstly complete and pay for your order on the first website. 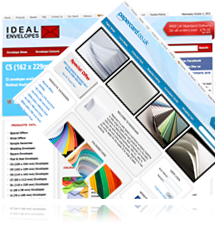 It doesn't matter which website you start off on, either Ideal's or PaperCard's. If you need to register for an account with us, then please complete the new user form within the checkout process. If you already have an account then please enter your username and password into the exsisting user form. Once you have completed the first order please go to step number two. Once you have completed and paid for the first order, move onto the second website. As you have registered for an account on the first website, you will not need to register for an account on the second. You can use the same username and password as before.When you have added all the products you wish to purchase into your shopping basket, simply follow the checkout process as normal. For your second order to combine with your first, your delivery details will need to be exactly the same as the first order.When you get to the delivery type selection stage you will be offered an 'Order - Addition' option. This will combine your second order with the first and make sure that both orders are shipped together. If your second order has taken you into our next delivery charge bracket, a post charge adjustment will be made within your invoice. The £75 (ex VAT) free delivery only applies to single websites and not a combination of both websites. Freedelivery will not apply to combinations of orders placed on a single website or combinations of orders placed on multiple IEL network sites. No exceptions will be made. If you complete the order right to the very end, that will be your orders placed.